John Masefield was poet laureate from 1930 to his death in 1967. He was a prolific poet and fiction writer, and by the end of his life his volume of 'Collected Poems' had sold over 200,000 copies. This was an unprecedented figure for a modern poet, and spoke to his popularity with readers. Today, however, he is perhaps most well known as a children's writer, having authored such classics as The Midnight Folk (1927) and The Box of Delights (1935). 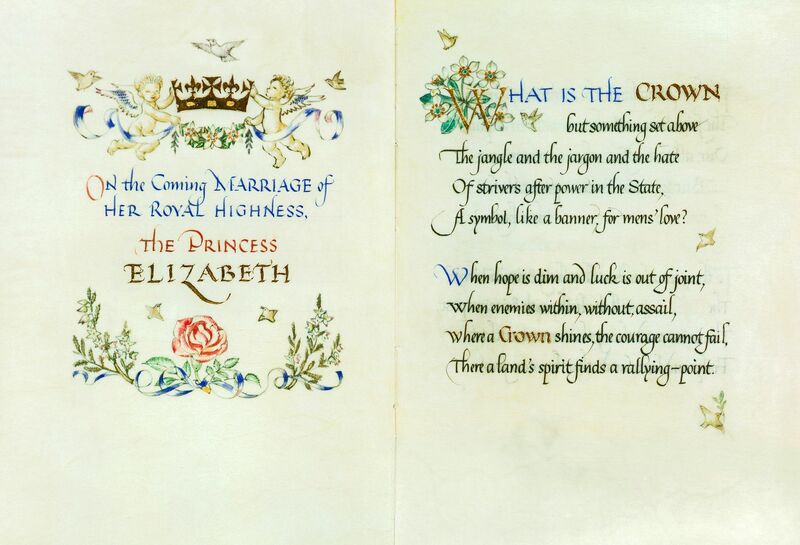 This is a beautifully decorated copy of the poem written by Masefield to celebrate The Queen’s marriage. It was presented to her in October 1947. Masefield’s poem expresses the importance of the Crown to Britain and to her allies and dependents, and the sense of security, renewal and future regeneration symbolized by Princess Elizabeth as heir to the throne, and a bride-to-be. The lettering and decorations were executed by Dorothy Hutton. She studied under Graily Hewitt, and was an official artist to the Crown Office.